"Rhumah Kartika Dharma" is a Balinese/contemporary California-style villa built amidst rice paddies, banana and fruit trees, informal and formal gardens, overlooking a river gorge in the Ubud area of south-central Bali. This is an area of breathtaking beauty and abundant artists, working in medias of wood, oils, acrylics, stone carving and batik. Traditionally, it is also the home of some of Bali's best dance and musical troupes. It is also an area of sensitive low-key people, sincerely involved in daily religious rituals and the "art of living." After several visits to Bali many years ago and involvement both as a medical lecturer there and in the fine arts importing business,I designed and built "Rumah Kartika Dharma" on land owned by my good friends, Dr. and Mrs IBG Manuaba and their family. (Foreigners cannot own land in Bali; I act as a "shepherd" for the land, and rental agent from the US.) I consider Ubud, Bali my "second home" and visit there yearly. The home has two enclosed air conditioned bedrooms (one with a small king-sized bed, the other with queen sized and twin beds, both quite comfortable), as well as a Chinese wedding bed with mosquito netting in an upstairs lounge area with fan and small armoire which can sleep additional people, if required. The open upstairs area is perfect for painting, working, and dancing. There are two semi-enclosed bathrooms with garden areas attached to the bedrooms, and an enclosed kitchen area. The kitchen is equipped with propane stove, refrigerator and blender. Electricity is 220 v. WiFi onsite. 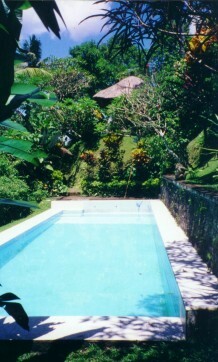 The estate is a 15 minute walk from the outskirts of Ubud. A Balinese couple and their father live nearby and provide full upkeep, including cooking delicious meals, laundry, shopping, babysitting, errands, gardening, etc. Made Suardi, the house manager, usually sleeps in a separate secluded structure on the land, providing security. There are also several restaurants within walking distance, as well as art galleries, shopping, etc. The villa is very private and is situated on the edge of a gorge with a terrific view, as well as a 4x13 meter spring-fed swimming pool. Rumah Kartika Dharma is not a sterile, 5-star tourist hotel, with marble baths and DDT spraying for termites and other "wildlife" that abounds in the tropics. For that, you will have to look elsewhere (and at far higher prices...) Dr. Manuaba's and my home is a gorgeous, private, serene, and unobtrusive slice of "...old Bali..."
Bicycles, motorbikes and automobiles may be rented quite economically. There is also abundant public transportation. The weather in the area is somewhat more pleasant (not quite as hot and with less insects) than the beach areas; these are approximately 45 minutes to 1 hour away.